During the recent US elections, Twitter decided to add an ‘election bar’ as part of their site design. You could close it if it annoyed you, but the action wasn’t persistent and the bar would always come back like a bad penny. Sport! My dreams of site skinning tennis are not yet fully realised, but it’ll be all the rage by next Christmas, believe me. Write CSS rule(s) to override and/or enhance it. 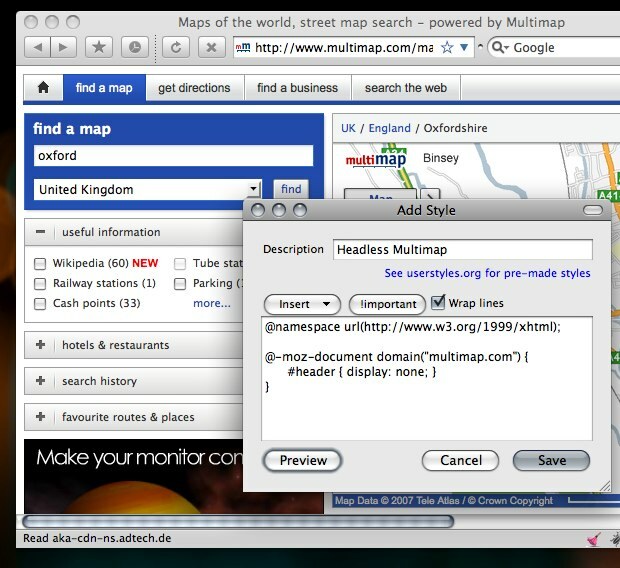 Let’s start small with Multimap.com. Look at that big header – it takes up an awful lot of screen space doesn’t it? No matter, we can fix it. Now we need to find out where that big assed header is in the DOM, and make overriding CSS rules. The best tool I’ve found yet is the Mac OS X app, CSS Edit. 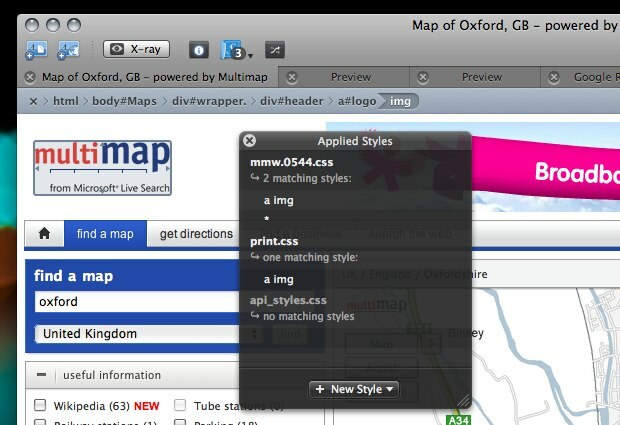 It utilises a slick ‘override stylesheets’ function and DOM Inspector. Rather than give you all the usual DOM inspection tools, CSS Edit’s is solely concerned with style. Go into ‘X-Ray’ mode, click an element, and look at the inspector window to see every style rule governing it. Click the selector to be taken to where it lives in the CSS. It really is a user styling dream app. Having said all that, you can achieve all this with free, cross platform tools – namely Firefox with the Firebug and Stylish extensions. We’ll be using them for these examples, so make sure you have them installed if you want to follow along. Using Firebug, we can see that the page is very helpfully marked up, and that whole top area is simply a div with an ID of header. All you need to do is add the CSS to hide the header, in between the curly brackets. A click of the preview button shows us that it’s worked! 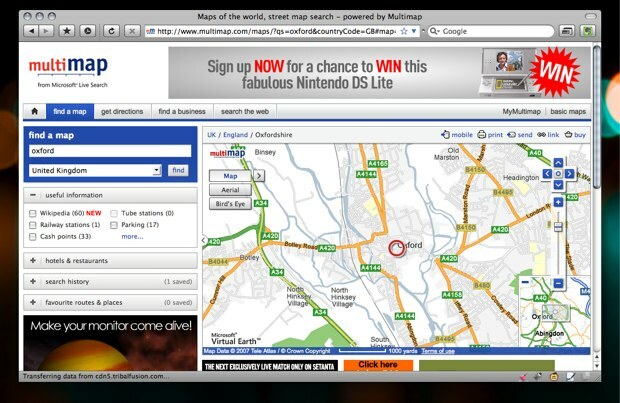 Now the map appears further up the page. The ethics of hiding adverts is a discussion for another time, but let’s face it, when did you last whoop at the sight of a banner? What’s more, whenever a style is updated, Stylish will notify you, and offer a one-click process to update it. This does only work in Firefox and Flock, so I’ll cover ways of applying site styles to other browsers later. 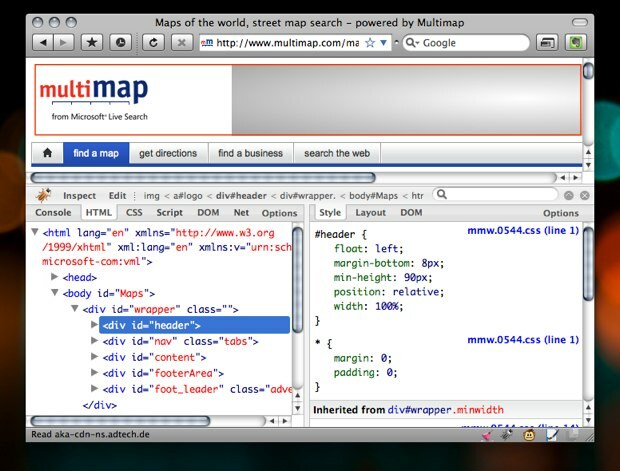 In the Multimap example there wasn’t a display specified on that element, but it isn’t always going to be that easy. You may have spent most of your CSS life being a good designer and not resorting to adding !important to give your rule priority. There’s no way to avoid this in user styling – if you’re overriding an existing rule it’s a necessity! Be prepared to be typing !important a lot. making the height and width zero. Woah boy! What was all that gubbins in the background-image? It was a Data URI, and you can create these easily with Hixie’s online tool. It’s simply the image translated into text so that it can be embedded in the CSS, cutting down on the number of http requests. It’s also a necessity with Mozilla browsers, as they don’t allow user CSS to reference images stored locally. Converting images to URI’s avoids this, as well as making a style easily portable – no images folder to pass around. Don’t forget all your other CSS techniques at your disposal: inserting your own content with :before and :after pseudo classes, make elements semi-transparent with opacity and round box corners without hacking . You can have fun, and for once, enjoy the freedom of not worrying about IE! Instead of using the Stylish extension, you can add rules to the userContent.css file, or use @import in that file to load a separate stylesheet. You can find this is in /Library/Application Support/Camino/chrome/ on OS X, or C/Program Files/Mozilla Firefox/Chrome on Windows. This is only way to apply user styles in Camino, but what about other browsers? There are a few options here: the PithHelmet and SafariStand haxies both allow custom stylesheets, or alternatively, a Greasemonkey style user script can employed via GreaseKit. The latter is my favoured solution on my Helvetireader theme, as it can allow for more prescriptive domain rules, just like the Mozilla @-moz-document method. User scripts are also the solution supported by the widest range of browsers. Hopefully I’ve given you enough information for you to be able start making your own styles. If you want to go straight in and tackle the ‘Holy Grail’, then off with you to GMail – I get more requests to theme that than anything else! This makes it very easy to write rules that only apply to that particular site. If you wanted to use Safari without any of the haxies mentioned above, this method means you can include rules in a general CSS file (chosen via Preferences > Advanced > Stylesheet) without affecting other sites. 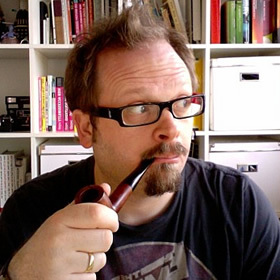 One final revelation on user styling – it’s not just for web sites. 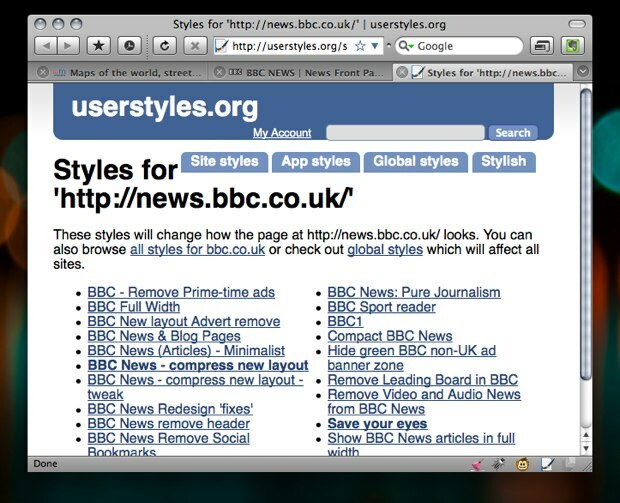 You can tweak the UI of Firefox itself with the userChrome.css. You’ll need to use the in-built DOM Inspector instead of Firebug to inspect the window chrome, instead of a page. Great if you want to make small tweaks (changing the size of tab text for example) without creating a full blown theme. Jon Hicks is one half of the creative partnership Hicksdesign, designing for a variety of mediums, but with a particular fondness for icon and logo design. In fact he’s written a book, about it called The Icon Handbook, released in January 2012. His recent clients include Skype, Mailchimp, Shopify and Opera Software, but is best known for his uncanny impression of Lucius Malfoy singing “I only want to be with you”.